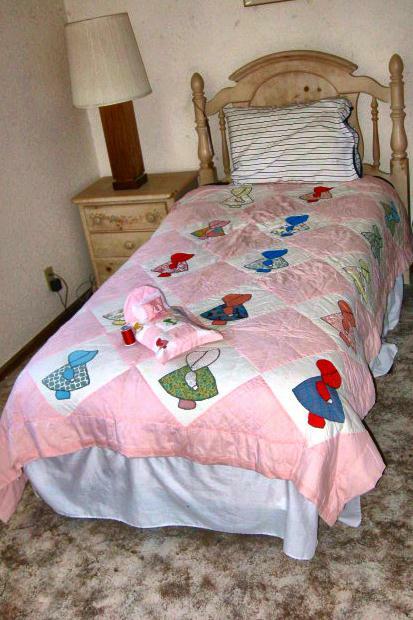 When my husband’s cousin emailed to ask me if I would like a quilt made by their great-grandmother I was delighted. 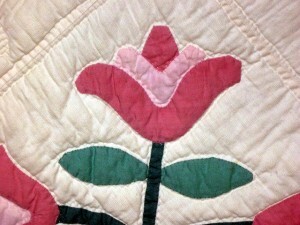 I love old quilts and cherish the ones with family history. 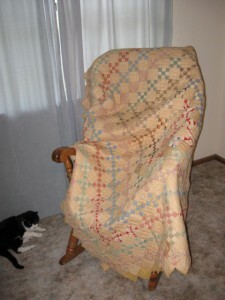 We had a lovely visit with our cousin this week and picked up the quilt. 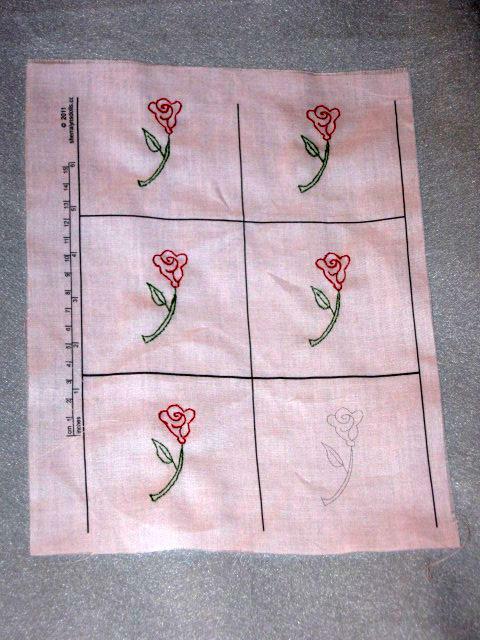 I had not expected a work of art. 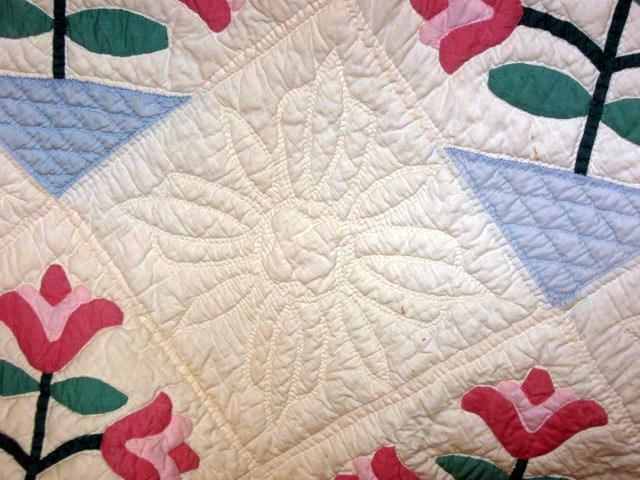 The needle work on the quilt is exquisite. I thought that I would share some pictures with you. 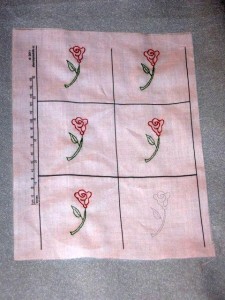 The flower applique is applied with a nearly invisible slip-stitch. 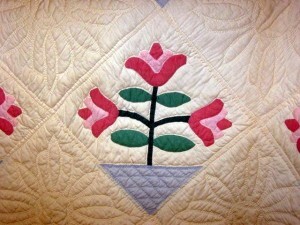 I love the quilting in the solid fabric blocks. 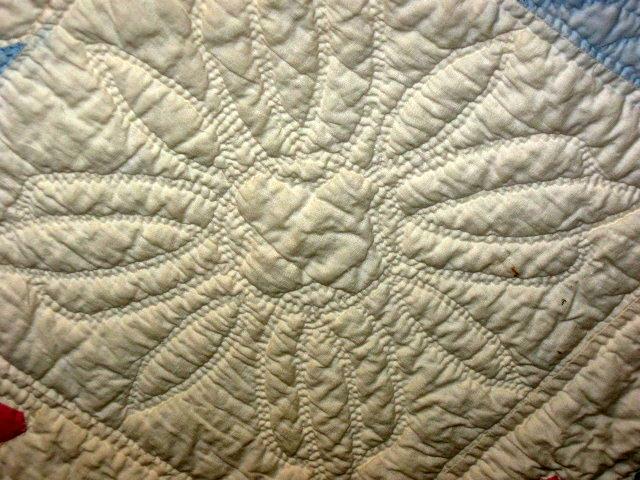 I do not know how the quilter was able to reproduce the design so accurately. Here is a detail of the quilting. 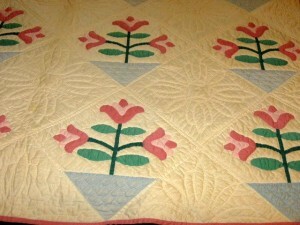 My grandmother loved to make quilts. Quilting is still an artistic pleasure for many people, but during most of my grandmother’s life it was one of the few artistic avenues open to her. 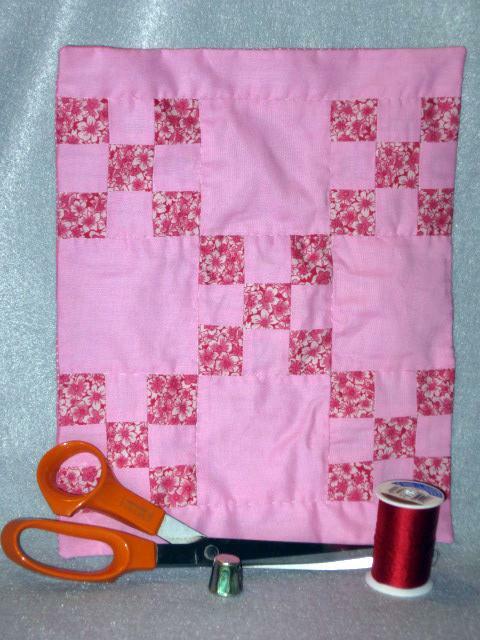 She could justify spending hours making something beautiful, because it was useful. 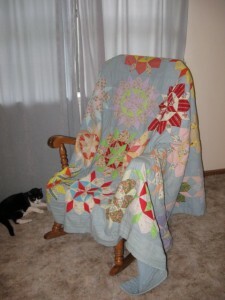 It was also made of fabric scraps, so that nothing was wasted. Quilting implied thriftiness. 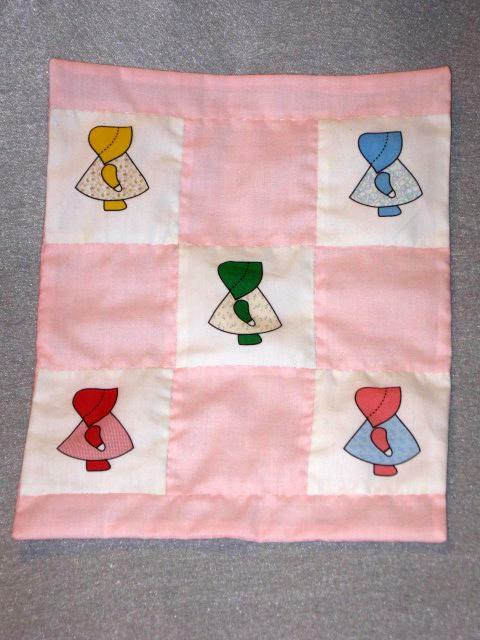 The loveliness of the pieces were enjoyed, but she was allowed to make them because they were needed. When she was older and had more leisure time, she pieced lots of quilt tops; had them quilted; and then gave them to friends. 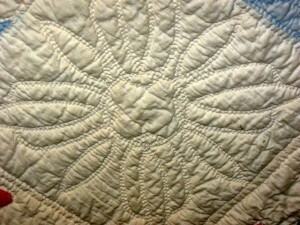 I love the quilt that she pieced as a wedding present for me. 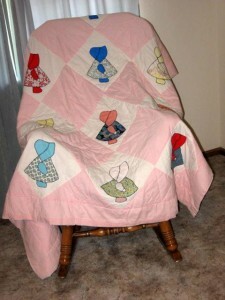 I also inherited her master piece. 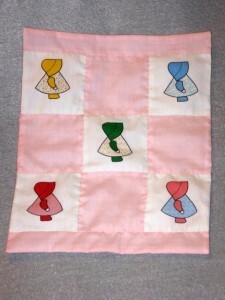 It is a nine patch that she made while she still had young children. The three inch patches were made from nine tiny one inch squares. 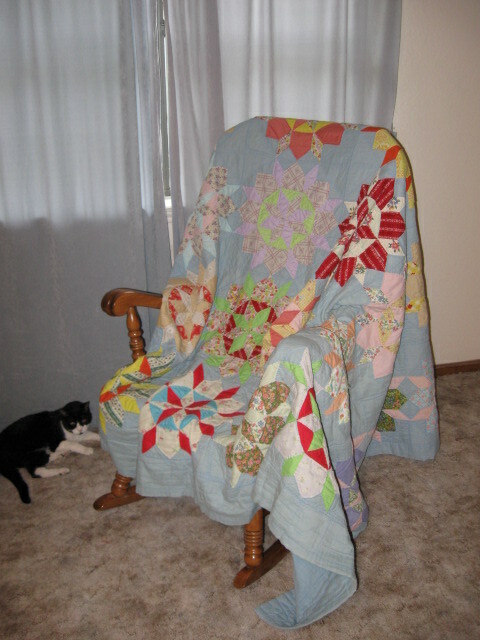 The quilt took a very long time to make. 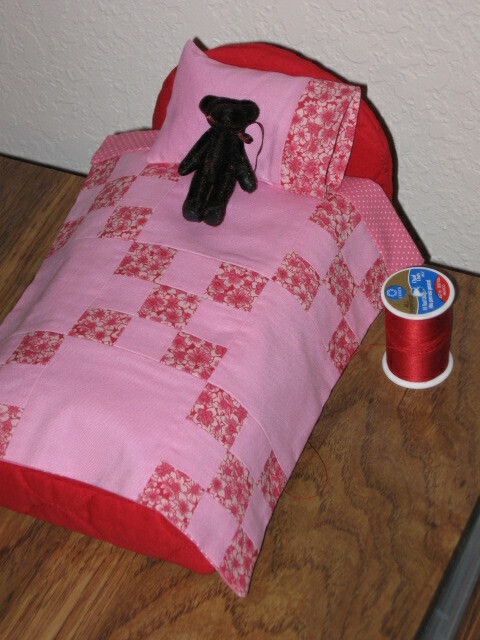 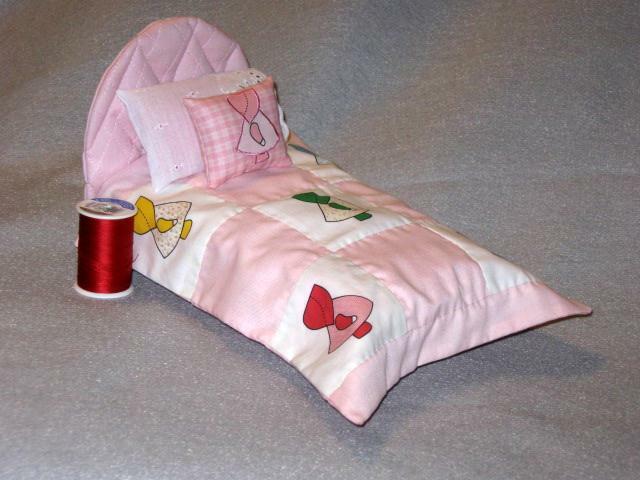 My current pattern project is a bed for small dolls. 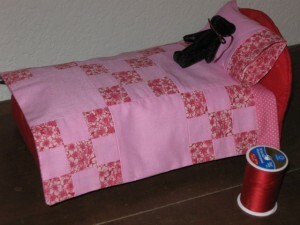 I am happy with the bed, mattress and pillow that I created, but I am having difficulties with the cover. I am trying to use the pattern of my grandmother’s nine patch quilt and am gaining more respect for her sewing skills with each attempt that I make.